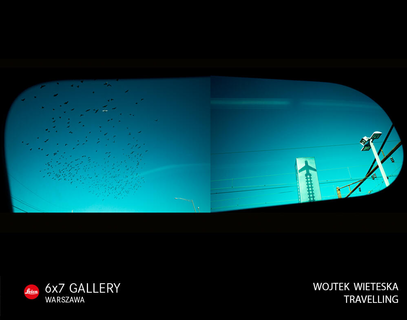 We invite you to the premiere show of the newest collage of works by Wojtek Wieteska untitled „Travelling”. The project consists of a photo-show, movie projection and a catalogue under the same titles. “Travelling” is a story about two kinds of love: love of a photographer to photography and his love to a mysterious blond named Agni (it means: “fire”). The relationship between the Photographer and Agni lasted almost a year. Their union was wrapped day after day with photography. As a result, a personal series of photographs was created and captured in a convention of contemporary fairy-tale. “Travelling” holds in yet another story – the one about the process of selection from few thousands of photographs and arranging own narration out of them. That is the reason why the show itself has a clear form and strictly planned scenography concept. “Travelling” consists of: an exhibition, mute move projection (with live music) and custom-size catalogue. Photo show at Leica 6×7 Gallery has unusual arrangement. Pictures are composed in diptychs and triptychs and printed on stripes oriented horizontally and vertically. Their sizes are 40 on 250 centimeters with black and with white background. The stripes are hang without frames. The base here is an ultra-lustrous photo-paper (with a surface almost like a mirror), which gives the very realistic feeling while watching the photographs. The intimate atmosphere is build up with light effects. „Travelling” movie premiere will take place on 5th of December 2017 at Atlantic Movie Theatre in Warsaw. The film is circa 20 minutes long and is a composition of still photos and moving images. The integral element of the movie is life music composed and performed by Ryszard Łochowski and Wit Apostolakis. I invited young musicians with bass and oboe to create sound spaces, because this kind of unusual tones are compatible with the atmosphere of my photographs – said Wojtek Wieteska. After the projection there will be a discussion with the participation of the audience, led by Artur Wolski (Atlantic Movie Theater). Wojtek Wieteska invites also: Rafał Łochowski (curator and producer from Leica 6×7 Gallery) and Grzegorz Jechna, who is therapist and hypnotherapist.